If you have read any of my other reviews then you might already know that I like to feed my dogs lamb-based dog foods. The reason for this is that lamb is largely grass-fed, which means that regardless of the brand you are buying, there is less GMO content. Nutro Large Breed Lamb combines a variety of proteins and whole grain rice, peas, and oatmeal with healthy fats for a complete meal your dog is likely to enjoy. This is a limited ingredient dog food so it may be suitable for dogs that are sensitive to “everything but the kitchen sink” dog foods. Produced in the USA. Most ingredients are also USA sources but a few things are too hard to get in the quantities needed so some foreign ingredients from a select network of suppliers are used. Real lamb is the #1 ingredient. Limited ingredient formula offers complete nutrition in an easily digestible formula for large and giant breed dogs over 18 months of age. Omega-3 and Omega-6 fatty acids help skin and coat stay shiny and supple. If your dog suffers from skin allergies at times, this food may help alleviate some of the problems. A change in diet is often recommended if a dog appears to suffer from chronic allergies or sensitivities. Since this doesn’t contain any of the major grains like corn, wheat, and soy protein, there is a reduced chance of some of the major allergies that pet’s today increasingly suffer from. I recommend this dog food to those that are looking for an affordable choice that considers the long-term health and needs of large and giant dogs. Note: The formula for this food recently changed. Compare the two ingredients lists below so you can make an informed choice. Remember that if you order and get older stock, you may have the older formula. (Vitamin B1), Vitamin D3 Supplement, Folic Acid, Rosemary Extract. If feeding Nutro Dog Food for the first time or changing formulas, we suggest you blend increasing amounts of the new formula with your old dog food for six days. Increase the transition time for up to 10 days if you have a dog that is picky or has a sensitive stomach. This dog food is intended for dogs at least 18 months old. Until your dog is this old you should feed a large breed puppy formula unless otherwise directed by your vet. Pregnant or nursing dogs may need 2-3 times the amounts listed on the feeding chart above. 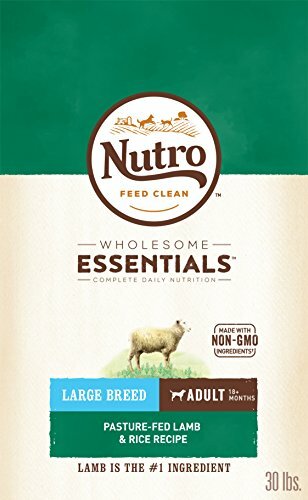 Nutro Large Breed Lamb is a very affordable option for large and giant breed dogs. The ingredients are top quality but I do wish that this formula had a little more variety. Compared to other Nutro formulas, this one doesn’t have the fruits and veggies that others do. I think my dogs like a more mixed ration. There are no probiotics added so you may want to add some of your own if you want to make it easier to digest. For some, the limited ingredients of this dog food recipe may be a big help. While the nutrition is balanced and the calories per cup are less than some brands of dog food, this can make it easier to encourage a healthy weight for a lifetime of strong hips and joints. Glucosamine and chondroitin provide even more support for the extra weight and strain big dogs put on their hips and joints on a daily basis.